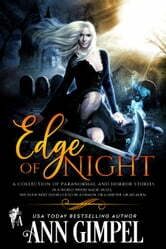 Here’s a roadmap to Edge of Night. Welcome to an eclectic collection of horror and paranormal short stories. It takes guts to read the stuff woven into nightmares. It’s a tough job, but you’re up to it. Welcome to my world. A world where magic holds court and the dude next door just might be a demon. Or a shifter. Or an alien. You’ve done time at the edge of night. Nail-biting, stomach-churning time filled with hissing snarls, menacing growls, the whoosh of unnatural wings, and the flash of hellfire. Time that lasts forever but is over within seconds because it becomes unpredictable in places like that. You don’t want to stay, but it’s too fascinating—in a grisly, macabre, toe-curling kind of way—to turn your back on. You recognize it, though. The place just at the threshold of darkness where it’s not quite safe anymore. Evil broke its bounds at the edge of night, or maybe it always ran free and we’ve been deluding ourselves all along. Join me for an even dozen supernatural tales. Monsters, demons, gods—fallen and otherwise—ghosts, aliens. A touch of science fiction. More than a splash of romance. 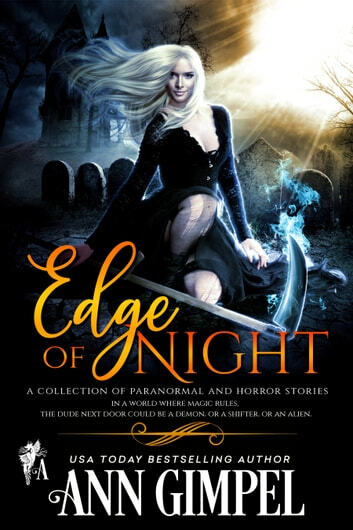 From magical lands to a chilling glance into the past, Edge of Night has something to tempt everyone. Everyone who craves danger, that is. This is a collection of snippets from stories (Garen is the first snippet & Blood and Magic is the second snippet) & short stories. These were good stories that could leave you wanting more. I'm a big Ann Gimpel fan, and I read this in 2 different sittings. I didn't find this collection met my overall expectations, but I am glad that I read it.